Male; Graduate of Auto Mechanic courses with relevant work experience at least 3 years; Preferably with TESDA Certificate; Knowledgeable in under chassis and steering system; With Driver License (restriction code: 3) is a must. Male; At least High school graduate; Experience in auto mechanic related is an advantage. Female; At least 2 years computer related course; At least 2 years work experience; Knowledgeable in computer troubleshooting / maintenance. Male; Candidate must possess at least a Bachelor’s/College Degree, AutoCAD, IT courses or equivalent; Preferably 1 – 2 years experience, specializing in Architectural Design or equivalent; Knowledge in Sketch up, MS Office, Adobe Photoshop, Autocad; Willing to work extended hours; Can work in a minimal supervision in a fast-paced environment; Excellent communication skills both oral and written. Female; Vocational graduate or College graduate. Female; Graduate of BS Nursing; Preferably with experience. Bachelor’s Degree in any business related course, preferably in the field of Marketing / Advertising / Communication or any related field; With experience as Sales and Marketing Officer; Background in Customer Service, project Management and/or product Development is an advantage; Digital savvy and proficient in Photo and Video Editing Microsoft Office and Adobe Applications preferred; Experienced driver (at least 4-wheel vehicle, manual & automatic) with a valid Non-Professional – Professional License is an advantage; Physically fit; With excellent interpersonal, written and oral communication skills; Must be flexible and can work under pressure with minimum supervision; Goal oriented, Passionate, Extrovert, Aggressive Social media User and with Go Getter Attitude. Male / Female; Must possess any Bachelor’s/College/Associate Degree; Admin experience is an advantage; Presents strong knowledge in general MS Office products (Excel, Word, Photoshop, etc. ); Keen on details; Good English communication skills is preferred. 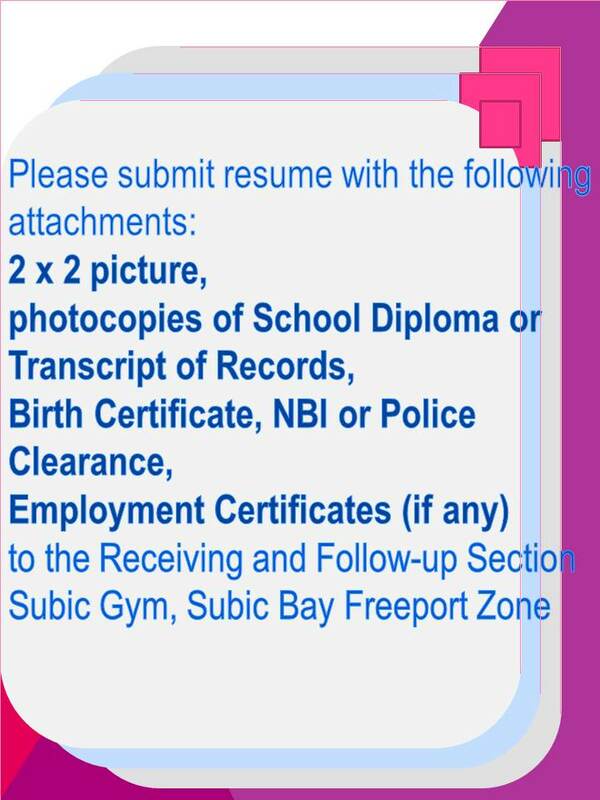 Applicants are advised to register at the Receiving Section, Subic Gym on/before FEBRUARY 28, 2018 before proceeding to the Wistron Infocomm (Philippines) Corporation located at #4 Rizal Highway corner Aim High Avenue, Subic Bay Gateway park, Subic Bay Freeport Zone, from Monday to Friday, 10:00am (Exam) and 1:30pm (Interview) and look for MS. CRISTINA LIM.